This cruise will provide a fabulous encounter with the dramatic contrasts of a truly wonderful continent. Spectacular memories will be garnered from an amazing variety of vibrant ports. There are hidden treasures in every destination visited - cultural, historic and scenic. Enjoy vibrant colourful cities, surprising architecture of picturesque colonial towns, pristine rainforest canopies, iconic attractions, joyous seasides, and the opportunity to explore lively market squares for unique crafts, leather goods and antiques. The romance of this journey is obvious. 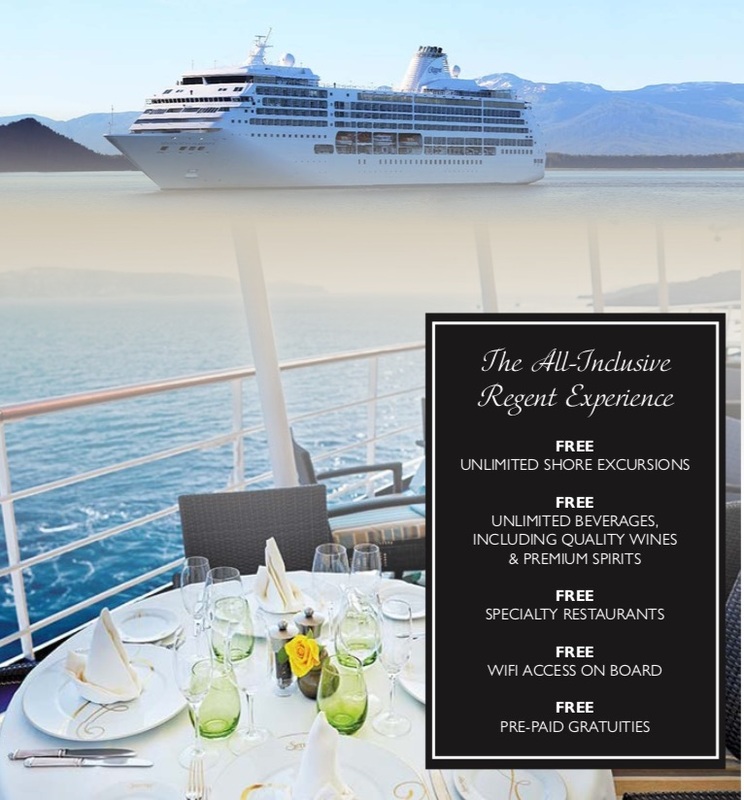 Free unlimited shore excursions in every destination will expose you to some of the most exhilarating experiences of this passionate and exotic continent - from behind-the- scenes tours of world-renowned places, to savouring the local flavours of esteemed wineries and restaurants. 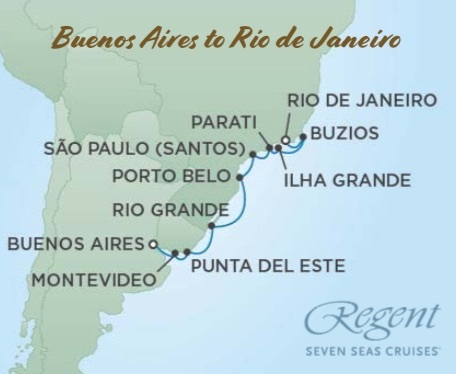 Cruising in all-inclusive luxury from the 'Cradle of Tango & Evita' (Buenos Aires) to the 'Home of Salsa, beach culture & the Bossa Nova' (world-famous Rio), via a special selection of diverse and spectacular ports, will provide unforgettable experiences that stay with you for the rest of your life. Your hosts for this fabulous 10-day journey are experienced South American enthusiasts, Beth & Bob Malcolm. They are consummate travellers with personal experience of exotic destinations in all corners of the globe. You will find that Beth & Bob will take every opportunity to make this cruise one of your life's most outstanding memories. The warm friendly ambience of Seven Seas Mariner creates a perfect atmosphere for socialising, and all the on- board pleasures are included. Staff on board this beautiful ship understand how important it is for you to enjoy the moments that matter the most. Take in the sunset, embark on a host of the most interesting excursions (as many as you like, all complimentary), savour exquisite meals, and share laughs with new-found friends. Mingle over cocktails in a piano bar, join a samba class in one of the lounges, watch a Broadway-style performance in the intimate theatre, or join a top-quality lecture. This ship is just the right size for feeling totally 'at home' with the 'on-board family'. Enjoy a swim in the pool or relax in the adjoining jacuzzi. Expand your horizons at a world-class lecture by a respected expert. Participate in a game of table tennis or practise your golf swing on the sports deck. Stop by the Coffee Connection or cafe for an expertly prepared expresso. Reinvigorate your senses in the fitness centre, or try the sauna and steam rooms. Step out in one of the lounges and dance to the music of a live band. Meanwhile, your Suite Steward will take care of making your suite feel like home. They will re-stock your in-suite mini-bar, and deliver fresh fruit each day. Suites are tidied up twice each day. The Maitre D sets a standard beyond what you have experienced in the past. Charming and talented Entertainment Staff frequently host dinners and social gatherings, which add to the congenial on-board atmosphere. The entire crew from the Waiters to the Pool Attendants ensure that your experience feels like an exclusive lifestyle. Refresh, relax and reflect - feel completely at home in your gracious suite, which features custom-crafted furnishings, original artwork, and a large private balcony, together with every imaginable amenity. People who ordered Exotic South America Cruise also ordered the free travel brochures below. Click on the images to find out more about these brochures.